For every survey you complete with My Survey UK, you will earn points. You can redeem your points for a variety of prizes including Amazon gift vouchers, John Lewis gift vouchers, charity donations, as well as a whole other range of rewards. My Survey has also started offering PayPal cash payments as an option for point redemptions. Only 1000 points, or £10 is needed in your account in order to convert points into rewards. When you have enough points in your account, go ahead and select Amazon.co.uk e-vouchers as your reward option! Tons of other gift cards are available through MySurvey including TANGO cards, Starbucks cards, iTunes e-cards, as well as various other restaurant and retail vouchers. They also offer quarterly cash draws of £2000. Three lucky winners will split this great prize four times a year, and the cash will be sent to the winner via cheque in the mail. Members can check their point balances at any time by logging into their accounts. There they can also update any contact information, check out new reward options, and redeem points for rewards of their choosing. Panelists can also refer friends and family to earn additional bonus points. Helpful Tip! Add emma@mysurvey.eu to your safe list of email contacts in order to make sure you receive all online survey invitations! You don’t want them ending up in your junk mail folder by mistake. MySurvey also offers its members the optional opportunity to participate in two types of mobile surveys: text-messaging surveys as well as smart phone surveys. Text-messaging surveys can be used by any mobile phone and survey questions are texted to members, and in return members text their responses back. Smart phone surveys involve a link that is sent to panelists, and upon clicking the link they are brought to a web page within their phone browser. They can then complete the survey using their mobile device. 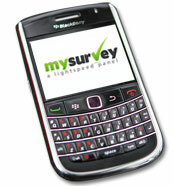 Mobile phone surveys are offered as an option for members to take – it is not a requirement to participate as a member of the My Survey survey panel. Participation in the program allows members additional opportunities to earn points redeemable for their choice of rewards. Some members may receive an invitation to join MySurvey Connect – an exclusive, invitation-only panel. Earn over 1000 extra points per year by simply installing a small application onto your computer which will anonymously track your online activities. Approximately 10,000 people in Britain are currently enrolled in the program. An added benefit to participating is the possibility of pre-qualification for special online surveys. My Survey UK is an online survey panel run by Lightspeed Research, who in turn is run by WPP, one of the world’s largest communications services groups in the world – employing over 131,000 people. They conduct market research on a variety of topics and their studies are periodically published in publications including the Financial Times, Wall Street Journal and Time magazine. In 2014 alone, over GBP 20 million was awarded to members. To get started with My Survey UK is simple: complete the registration form in less than five minutes, confirm your registration by clicking on the link in the confirmation e-mail they sends you, and from here on in they will contact you via e-mail every time an online survey is available for you to complete. The survey invitation e-mail will tell you what the survey is about, approximately how much time it will take you to complete as well as what your reward for taking the survey will be.